These cute paper plate portholes are quick and easy lots of fun for all ages! Just make sure you cover any surfaces when working with PVA glue! 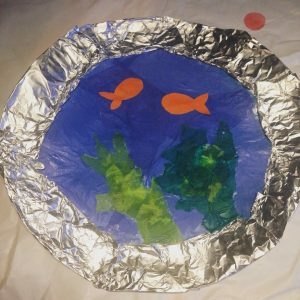 You will need scissors, PVA glue, orange paper, blue and green tissue paper, paper plates and kitchen foil. Stick the blue tissue paper to the plate. Overlapping creates different depths of blue. Tear small pieces of green tissue paper and glue the into seaweed shapes. You can mix the colours and overlap to create different shades of green. Cut small fish from the orange paper and stick them to your plate. Glue kitchen foil around the edge of the plate to complete the porthole effect.